We deal with output redirection all the time. Review how to do it in Python here. That last print statement will go to stdout, not the file. This is a test of Python! Thank you for calling me! Now wasn’t that pretty cool? When you run this code, it will write out two lines of text to your file and one to stdout. As usual, we reset stdout at the end of the function. This code is a little simpler because the built-in function does all the yielding and resetting of stdout automatically for you. Otherwise, it works in pretty much the same way as our custom context manager. print "You pressed the button!" This code just creates a simple frame with a panel that contains a multi-line text control and a button. Whenever you press the button, it will print out some text to stdout, which we have redirected to the text control. Give it a try to see how well it works! Now you know several different methods for redirecting stdout to files. Some methods are better than others. Personally, I thought it was cool that Python 3 now has a context manager built in just for this purpose. Speaking of which, Python 3 also has a function for redirecting stderr. All of these examples can be modified slightly to support redirecting stderr or both stdout and stderr. 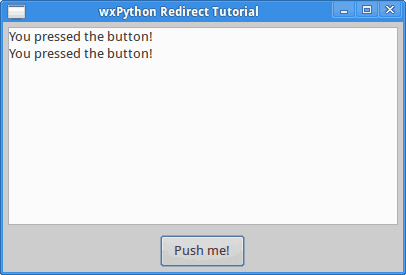 The very last thing we touched on was redirecting stdout to a text control in wxPython. This can be really useful for debugging or for grabbing the output from a subprocess, although in the latter case you will need to print out the output to have it redirected correctly. Published at DZone with permission of Mike Driscoll , DZone MVB. See the original article here.